Abbie is up on stage singing karaoke and is doing an awesome job, (who knew Nicole Beharie had such an awesome set of pipes) as Ichabod, Hawley, and Jenny watch. Jenny and Ichabod talk about his relationship with Abbie. Ichabod says that he and Abbie have made their peace but Jenny is concerned that Ichabod and Abbie are spending a lot less time together. Ichabod questions if Abbie has said something and when Jenny says no, Ichabod reiterates that they have moved forward. Abbie joins them at the table and Hawley takes his leave after his lead on some throwing stars comes through. Jenny offers to tag along for company but Hawley turns her down. Hawley arrives at the designated meeting spot expecting to meet with McKenna and instead, Carmilla Pines makes an appearance. Even though Carmilla Pines raised Hawley, he has been avoiding her for about a decade. Hawley turns to leave but Carmilla stops him saying that it is more complicated than that, adding that she wouldn't be here if she didn't need to be. Carmilla plans to rob Theodore Knoxs estate here in Sleepy Hollow and wants to do it with Hawley. Carmilla makes it clear that her life is on the line now but Hawley says that it's too weird and out of the blue. Carmilla then transforms into some kind of monster and tells Hawley, "that's the way life is." Carmilla makes it clear that Hawley owes her and it is now time to repay his debt. Ichabod has taken the stage to sing the most depressing thing ever. Jenny and Abby talk about Ichabod's skill at the mic. Jenny points that Abbie and Ichabod were on opposing sides when it came to Abraham and much to my horror, Abbie says that Katrina was right to free Abraham when she did. 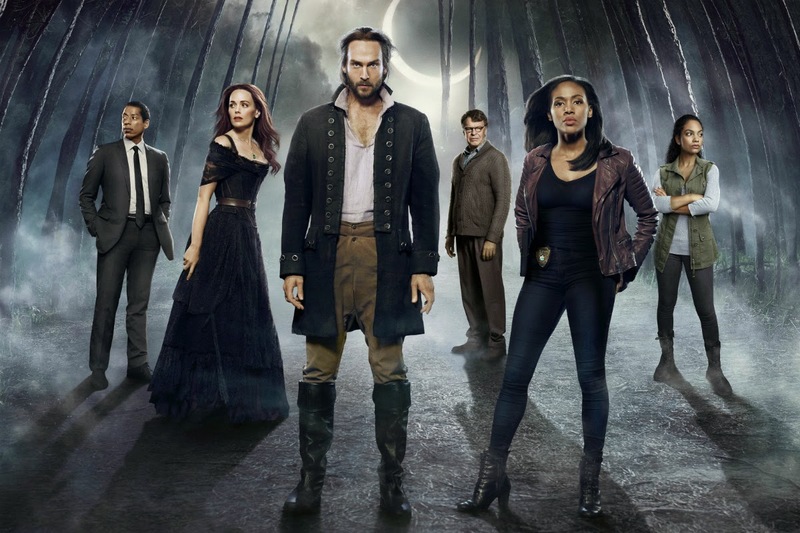 Abbie justifies this statement because Orion was going to go biblical on Sleepy Hollow. What? What? No, absolutely freaking not. NO!!! Abbie then asserts that she is fine with Crane. Abbie shifts the conversation to Jenny's relationship with Hawley. Jenny says that maybe something is going on and expresses worry that Hawley has not returned her phone calls and texts, considering he promised to only be gone for a little while. Abbie suggests that Hawley lost track of time but Jenny is certain that Hawley wouldn't blow her off like that. Ichabod is off the stage and snarks when Jenny expresses concern over the missing Hawley. When Abbie makes it clear that Hawley had promised to return this evening, Crane agrees to investigate. Before the team can get moving, Abbie gets a notification on her phone that there has been a breach at the archives. This shocks Ichabod because he had no idea that the archives were set up with a silent alarm. Abbie, Jenny and Crane make their way to the archives. Jenny sees an intruder and takes off running, with Abbie and Crane fast on her heels. Jenny catches Hawley and he tells her to back off, adding that he will explain later. Hawley tells Jenny to back off because Carmilla is desperate and dangerous. Jenny does not heed that advice and is attacked by Carmilla. Luckily for Jenny, Crane has arrived with his cross bow and he shoots Carmilla, causing her to release Jenny. When Crane and Abbie go to investigate further, Carmilla and Hawley are gone. Irving is in front of a judge and Cynthia is acting as his defense attorney. It seems that the state has dropped all charges, so based in the new evidence, the judge exonerates Irving of all charges. Frank and Cynthia are astonished by the news. Frank tells Cynthia that he is finally coming home to her and Macy but Cynthia does not seem pleased about this. Abbie and Jenny arrive at McKenna's pawn shop and Jenny again questions Abbie's relationship with Crane, pointing out that though they are all on the same case, Crane is working with Katrina and Abbie is working with her. Abbie however points out that since Ichabod and Katrina are trying to work on their relationship, while mourning the death of their horseman of war son, she is not going to sweat the small stuff. Jenny points out that it's not going to stay small forever. When McKenna appears, Abbie immediately asks who paid him to set up Hawley. McKenna of course denies knowing what Abbie is talking about, so Abbie suggests that he accompany her down to the station because he is likely fencing stolen goods. This approach does not work on McKenna, who makes it clear that he is not going to talk and Abbie will have lost a day on paperwork. Jenny slams McKenna's head into a glass case, saying that McKenna tried to assault her and that it is a sentence of ten years, given McKenna's prior convictions. McKenna quickly reveals that it was Carmilla Pines and so Jenny releases him. Jenny immediately becomes angry and explains to Abbie that Pines is a treasure hunter and is not like Hawley because she is a dangerous killer. Katrina and Ichabod are looking through the archives discussing Mary Poppins of all things. Ichabod comes across a charm which is a duplicate of the halo blade used by the angel Orion. Katrina calls it a beacon used to summon an angel which leads to Ichabod realising that Orion gave the charm to Abbie and she didn't tell him about it. Jenny and Abbie return to the archive and Ichabod hides the charm and doesn't mention it. Abbie reveals that they are looking for Carmilla Pines, who was Hawley's legal guardian from the ages of 12 to 18. Ichabod reveals that Hawley stole architectural designs belonging to Henry Knox and that Knox had an obsession with locks and puzzles. Of course, there is a Revolutionary link. Jenny says that the estate is now owned by Theodor Knox, who collects black market antiques and weapons. Carmilla and Hawley go through the architectural designs and Carmilla compliments Hawley on his work thus far. Carmilla then asks about the people in the archive tunnels but Hawley says that she is not to concern herself with them, adding that he has done what she asked. Hawley questions what happened to Carmilla and she replies that it was after he ran off. Hawley declares that he ran because her saw her murder someone. Carmilla claims that she tried to protect Hawley but he ran. Hawley however is not swayed, declaring that he saw Carmilla the way she killed her victim and that it was clearly not her first murder. Carmilla claims that she followed Hawley to Mumbai, where she was captured by a death cult and then turned into this creature. Hawley refuses to accept responsibility, so Carmilla show him the mark of the vetala on her back. Carmilla claims that even after she heard that Hawley was here, she left him alone but Knox has an artifact which could give her back her life. Hawley is not swayed and says that he got her the blueprints and that Carmilla is on her own now. Carmilla tells Hawley that she is the only family he has left and again asserts that the artifact will make her human again. Carmilla begs for help and Hawley agrees to help one last time. Ichabod races through the street and he and Abby end up bickering about how fast Ichabod is driving. Ichabod questions why Hawley was raised by Carmilla and Jenny explains that Carmilla was his God mother and took him in after Hawley's parents died, when he was twelve. Jenny, Abbie and Ichabod form a plan on the drive over to the Knox estate, with Ichabod declaring that they must stay together at all costs. Cynthia and Frank are lying in bed together and Frank notices that Cynthia is very upset. Cynthia says that Frank was dead and that she saw his grave and mourned him. Cynthia wants to know for sure that she is interacting with the real Frank Irving. Frank questions if Cynthia believes that Henry has a hold on his soul and Cynthia admits that she doesn't know but adds that she is scared. Cynthia wants to know for sure because Macy is set to return tomorrow. Frank replies that he doesn't have an explanation for this and only knows he is alive. Cynthia brings up Abby and Crane and acknowledges that they are not his favourite people right now for good reason but Abby said that Katrina could help them. A party is in full swing at the Knox estate and Carmilla and Hawley are in attendance. Jenny, Abbie and Crane arrive at the party and quickly pick out Knox, Hawley and Carmilla. Jenny heads out to deal with Hawley and Crane and Ichabod leave to take on Carmilla. Before they can get far, Theodore Knox approaches Ichabod, curious about his crossbow. Hawley is now inside the Knox mansion and he sets to work on the cryptex lock on the safe, which opens for Carmilla in another area. Jenny confronts Hawley about what he is doing with Carmilla and Hawley says that he doesn't have a lot of options because Carmilla is a monster. Jenny points out that Hawley has them and Hawley agrees, only to lock Jenny in a closet, again telling her to stay out of this. Hawley grabs his bag and leaves the room. Abbie watches Carmilla, who is inside the vault. Carmilla looks through the artifacts and selects one with multiple arms like Cali. Abbie raises her gun and shoots but Carmilla simply leans backward and avoids the bullet. Carmilla then grabs Abbie by the throat, lifting her off the ground. Ichabod appears, crossbow at the ready, demanding that Carmilla release Abbie. Carmilla unleashes her venomous claws, warning Ichabod that should he shoot, Abbie will die. Hawley shows up and steps in between Crane and Carmilla, telling Carmilla that she got what she wanted. Carmilla is not convinced and points out that Abby is a cop. Hawley promises that if Carmilla let's go of Abby and promises not to go after Abby and Ichabod that he will stay with her. Abby points out that there are three of them and one of her but Hawley is adamant that things cannot work like that. Hawley suggests that Ichabod and Abbie be locked in the vault, adding that by the time they are found, he and Carmilla can be far away. Ichabod tells Hawley that he didn't like him when they met but since then, he understands that Hawley is a courageous man of passion, who fights for his friends. In response, Hawley raises his gun and points it at Ichabod, saying that maybe Ichabod had it right the first time. Carmilla agrees with Hawley's deal and Ichabod and Abbie are locked in the vault. In the vault, Abbie discovers that she has no cell service. Ichabod says that the statue of Cali which Carmilla stole is the key to a dark ceremony which turns humans into vetalas. Ichabod and Abbie begin to bicker about how they got locked in the vault. It seems that they both had a different idea of what they were supposed to do. Ichabod suggests that they put this behind them until they get out. Hawley tells Carmilla that he shouldn't have left and that he owed her more than that before taking a drink. Carmilla tells Hawley that she wishes she could believe that, just as he collapses on the ground. Carmilla tells Hawley that he will never leave her again and that were family once and will be family again. Abbie and Ichabod look for a failsafe exit to the vault and Ichabod finds knobs which control the door. Abbie brings up the sigil and says that she felt that bringing it up after the fact, would be like opening a can of worms. Ichabod agrees that Abbie is not the only one responsible and brings up his decision that Abraham should be saved without talking it over with Abbie. They agree that they had both decided it was easier to act than to talk. Abbie wonders if they are still good partners and Ichabod says that even in times of great peril, they could always rely on each other but in the past few weeks, he has felt their bond tested. Ichabod does his Revolutionary War memory thing and realises which button he has to choose but instead of opening the vault, it locks down the vault even further, turning it into a death trap. Abbie questions which kind of chemicals that Knox loved and Crane goes through the list of things he knows about Knox, realising that Knox loved gold, though he died penniless. When Crane pushes the gold button, the vault opens up. Abbie snarks about the fact that they named Fort Knox after a guy who died in debt. Abbie and Crane make their way outside and meet up with Jenny, who has managed to escape from the closet. Jenny says that Hawley stole her cell phone and suggests that they can still track it. Crane, Jenny and Abbie arrive at the location where Hawley is being held. Jenny leaves to take a sweep of the perimeter and Ichabod and Abbie talk about the Kali statue. They quickly realise that Carmila can be killed with iron and fire. Inside, Carmilla has begun the ceremony to change Hawley. Hawley begs Carmilla to think about what she is doing and Carmilla tells Hawley that he will thank her later because he is going to love death. Ichabod interrupts the ceremony, shooting an arrow at Carmilla but missing. Carmilla summons her minions and Abby bursts in and joins the battle. Carmilla continues with the ceremony. Oh yeah, Hawley has an awesome six pack. Ichabod lights an arrow on fire and shoots it at the minion Abby is fighting. Jenny sneaks up on Carmilla and throws a statue at her. Carmilla stops the ceremony, shifts and begins to fight with Jenny. Hawley gets off the table and stabs Carmilla in the back and while her back is turned in pain, Jenny tosses Hawley a tire iron and torch. Hawley raises his arm to strike, saying that he is sorry and Carmilla disappears. Hawley returns to the archives and Jenny puts a knife to his throat. Hawley tells Jenny that he cannot blame her for the welcome he is receiving, as he places the architectural designs that he stole from the archives on the table. Hawley explains that Carmilla is why he kept his distance and Jenny says that though Carmilla was his family, Hawley now has a family in Sleepy Hollow. Hawley answers that he cannot be there because he betrayed her trust and adds that he is going to hunt down Carmilla. Abbie and Ichabod are back at the bar and agree that they must take care of the bond they share. Abbie and Crane get called to the stage to sing Proud Mary of all things. And yes, it's a first class abortion. Katrina starts a ceremony and warns Frank that it will delve into the fabric of his being. Franks says that he wants his family to know that he is free of Henry. When Cynthia steps back, Katrina asks Frank where Henry is, adding that the fact that Frank is here, tells her that her son (yes the bloody horseman of war) is still alive. Frank tells Katrina that he has no idea what she is talk about. Katrina hands Frank something to drink which he consumes. Frank sees visions of Henry and is own death. Katrina reveals that whatever magic bound Frank to Henry is gone. Frank runs to Cynthia and declares that they have a miracle as a pouty Katrina looks on. Cynthia asks Frank to promise that this is a new chapter in their lives and he promises. When Frank catches the reflection in the window, Cynthia is visible but he is not. I really like that a good part of this episode was about dealing with the relationship issue between Crane and Abbie; however, having Abbie agree that Katrina was right to free the freaking horseman of war was absolutely ridiculous. Nothing about that made any sense and an angry apocalyptic angel doesn't suddenly make Katrina's penchant for the horsemen of the apocalypse logical. Why couldn't they just have Ichabod agree that freeing Abraham was wrong as a way to bring them together? Oh I know, for some reason, the writers are determined to make the useless Katrina relevant. As we can see from Katrina's interaction with Frank, she still has no given up on the prodigal son. Katrina knows what Frank has been through and still yet it was all about the whole fruit of the womb thing. I am also pissed off by the fact that Abbie and Ichabod had time to go out karaoke but no time to spend with Frank. He sacrificed everything to help them and in return has gotten zilch. I want to see Jenny, Crane and Abbie working together again. Frank has been sacrificed for the sole purpose of elevating the useless Katrina. I hope that he can be reintegrated into the storyline now that it is obvious that while he may be back, not everything is right with Frank.